On Explosion, Weeds broadens his palette to include the colors and musical power--available in a large group setting. For fans of big band music, this is a must have! Features New York heavyweights Gary Smulyan, Joe Magnarelli and Steve Davis, plus Canadian legend PJ Perry. Features the robust tenor saxophone sound of Cory Weeds, backed by a 9 piece little big band! Inspired by two of his tenor heroes, Eddie ''Lockjaw'' Davis and Gene Ammons, who featured their sounds in a big band format on several occasions dating back to the late 50s, Weeds has invited a tremendous assortment of both Canadian and American musicians to join him in this new endeavour. On the Canadian side of the border, LITTLE BIG BAND EXPLOSION includes recent Order of Canada recipient PJ Perry (Edmonton), as well as a stellar lineup of players familiar to any Vancouver jazz fan; Steve Kaldestad (tenor), Chris Davis (trumpet), Rod Murray (trombone), Chris Gestrin (piano), Paul Rushka (bass), and Jesse Cahill (drums). 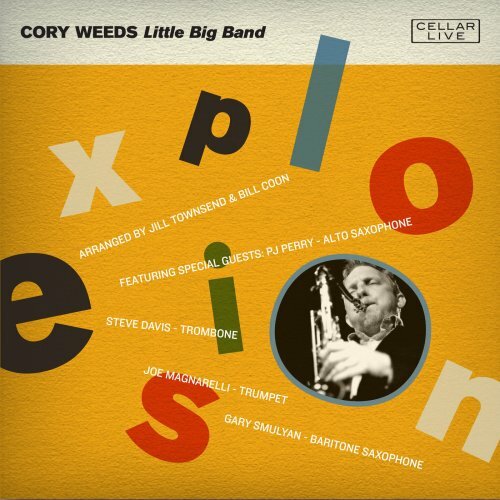 A band of just these fine Canadian players would be great listening on their own, but to this impressive core, Weeds has added some of his favourite New York musicians; trumpeter Joe Magnarelli (who appeared on Weeds' 2016 release ''It's Easy to Remember''), trombonist Steve Davis (2013's ''Let's Go''), and baritone saxophonist Gary Smulyan, a 30 year veteran of the world famous Vanguard Orchestra.